If intel officials could have testified to Trump’s obstruction innocence, they would have. National Security Agency Director Michael Rogers and Director of National Intelligence Dan Coats’ silence speaks volumes. 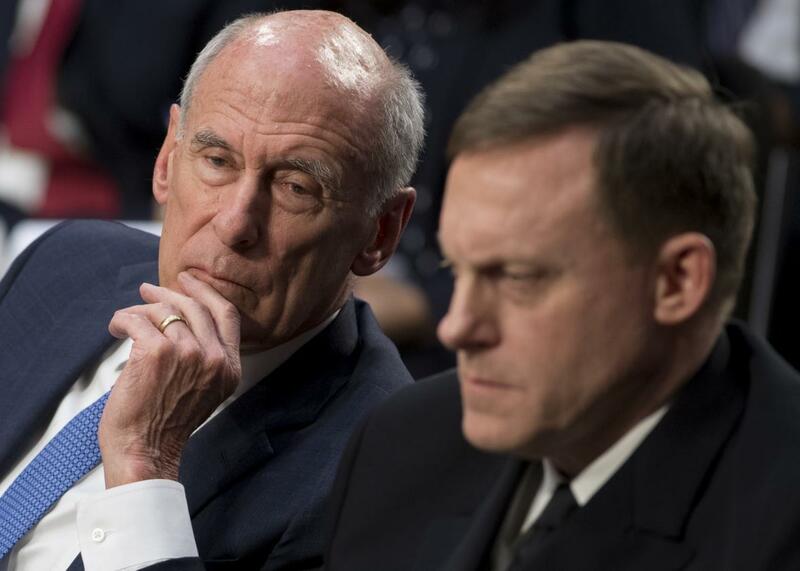 On Wednesday morning, Director of National Intelligence Dan Coats; Adm. Mike Rogers, director of the National Security Agency; acting FBI Director Andrew McCabe; and Deputy Attorney General Rod Rosenstein testified before the Senate Intelligence Committee. Officially, the hearing was about the Foreign Intelligence Surveillance Act. But all the Democratic senators, and some of the Republican ones, used the opportunity to question the men under oath about whether Donald Trump had tried to quash the investigation into his administration’s Russia ties, as the Washington Post and others have reported. To the senators’ mounting frustration, the intelligence officials repeatedly refused to answer their questions. Those refusals, however, tell us a lot. It appears they couldn’t defend Trump without committing perjury. Nor could they tell the truth without dramatically undermining Trump’s administration. So, in a series of increasingly contentious exchanges, they simply defied the lawmakers tasked with overseeing their agencies. Tuesday night, the Post reported that Coats told associates that Trump had asked him to intervene with then–FBI Director James Comey to get the bureau to back off its investigation of fired National Security Adviser Michael Flynn. (The Post had previously reported that Trump asked both Coats and Rogers to publicly deny that there was any evidence of collusion between the president’s campaign and Russia.) Grilled about these conversations with Trump, both men simply refused to answer, over and over again. Instead, they responded to questions that weren’t asked. In his opening statement, Coats said that he had “never felt pressure to intervene or interfere in any way with shaping intelligence in a political way.” But the senators weren’t interested in how Coats felt—they wanted to know what, if anything, Trump had asked him to do. “If what is being said to the media is untrue, then it is unfair to the president of the United States,” said a surprisingly dogged Sen. Marco Rubio. “And if it is, that is something the American people deserve to know, and it is something we as an oversight committee need to know.” And so, Rubio asked Coats and Rogers, “Are you prepared to say that you’ve been asked by the president or the White House to influence an ongoing investigation?” Both insisted they couldn’t answer in a public forum. Rubio tried again: “Have you ever been asked to say something that wasn’t true?” Once again, neither would give a direct answer. The legal basis for these demurrals was unclear. The White House has not invoked executive privilege, and the information at issue doesn’t appear to be classified—these officials initially described them as “confidential” conversations with the president, then seemed to switch to characterizing them as “classified” midway through the hearing. Several senators seemed infuriated at their stonewalling. “Why are you not answering these questions?” asked Sen. Angus King, an independent from Maine. “Because I feel it is inappropriate,” replied Rogers. “What you feel isn’t relevant, admiral,” King shot back, reminding Rogers that when he was confirmed, he’d taken an oath before the Armed Services Committee to give the committee the full truth. Rogers still wouldn’t budge. “It is my belief that you are inappropriately refusing to answer these questions today,” King concluded. He’s clearly right. Nevertheless, their unwillingness to testify to Trump’s innocence already answers a great deal.